An exciting opportunity has arisen for an ambitious and talented sales professional to work within the Dengie sales team. The role is predominantly key account management, developing the awareness of the Dengie portfolio with existing accounts and opening doors for new business both at retail and end user level. A large proportion of time will be spent on yards discussing feed rations, as well as attending shows and presenting to groups in the equestrian industry. The ideal candidate will have an excellent knowledge of the Thoroughbred industry both breeding and racing alongside proven sales record. Confidence around horses and the ability to convey a good understanding of equestrian knowledge is essential and a general understanding of equine nutrition is required. The nature of the position involves some weekend and evening work and staying away from home when necessary. The opportunity to travel will be offered to the right candidate. Excellent administration and organisational skills are essential. Full training will be given. Applicants need to be based within the area and must have a clean full driving licence. We offer a competitive remuneration package including a full expensed company vehicle. To apply for this position, please send your CV and covering letter outlining your suitability to emma@equine-careers.co.uk with details of your salary expectations by Friday 27th July. As part of a series of exclusive interviews with equestrian professionals, Dengie catches up with Sandy Phillips International Dressage Judge and member of the Eventing Ground Jury for 2016 Olympic Games. 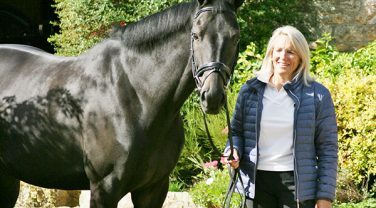 In addition to judging, Sandy is a professional dressage trainer based in the Cotswolds teaching riders from Novice to Grand Prix.